Nothing is worse than waking up in the middle of the night in a tent that has no ventilation. After a few times sweating through the night, you may want to check out a tent that will give you plenty of fresh air like the Kelty Salida 2-Person 3-Season Tent. The Salida 2 features mesh walls that give a ton of fresh air while protecting you with an easy to setup waterproof fly in case of rain. 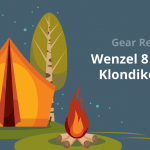 To find out more, read the Kelty Salida 2 Tent review below. Since the Salida 2 uses color-coded slips to guide set up as well as two DAC Pressfit poles, set up is very simple and not confusing. If you need more space, the Guyout points give you simple reinforcement and there are inner pockets that can hold your gear. Roof loops can also hold your equipment in the included gear loft. Packing up the Salida 2 is also simple with the Tent Cube storage bag that is thoughtfully designed, plus lightweight at just under 4.5 pounds so you can hit the trails in no time. The free-standing design of the Salida 2 makes it really fast and easy to pitch. Included collapsible aluminum poles are attached with a shock cord and they cross each other at the top of the tent. These poles are also connected with a clip system to the inner tent removing the need to pull the tent poles through the fabric sleeves like other tents. After you pitch the tent, you can construct the rain fly by just draping it over the pole structure and the inner tent and then fastening it with the corner clips that you find in the inner tent. Even though the collapsible tent poles tend to add some weight to the tent, you will appreciate the free standing design and how simple it is to set up pretty much anywhere in just a few minutes. This is especially helpful when you are trying to pitch your tent in an area with rocky terrain. The design of the rain fly is cut to fit the inner tent with a very definite dome-like shape that fits like a glove. This tight fit can prevent the air flow that you are otherwise enjoying with the Salida 2. If you choose to step outside and use the vestibule for some fresh air be careful with the pitch which can be difficult with the shape of the rain fly. It’s always a nice surprise to find ample storage inside your tent. The Salida 2 features two inner mesh pockets that are a little on the small side, but also includes a gear loft to store extra equipment. The inner mesh pockets are found in the corners that are good for storing small personal items that you need close by like your glasses and phone. The Salida 2 easily accommodates two people and two sleeping pads and most people find quite roomy. The tent walls are quite steep which makes the interior of the tent look spacious. The inner tent allows you to roll out a six-foot sleeping bag without hitting either side of the tent. 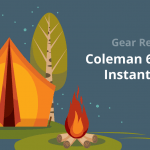 The inner tent also features ample gear loops to hang lighting and other accessories, and the included gear loft can be used to dry clothing out overnight or to stash flashlights and other small items. Mesh pockets are also found in the corners of the inner tent for additional gear storage. The rain fly has a distinct dome shape that was created to fit the inner tent like a glove. This design is great for keeping out the rain, but it also does a great job of building up moisture as it allows no ventilation when the rain fly is attached to the tent. During a storm, you don’t have the option of leaving the door open to allow air to cycle through and if the rainstorm is long enough all your belongings, including your sleeping bag, can become very damp. The Kelty Salida 2 tent is perfect for backpacking, and even though it is a 2-person tent, sharing it with someone will be a little tight. It comes with a D-shaped door on one side of the tent, which may make it awkward getting in and out with two people. The door also comes with a toggle system, so you can roll the door up and fix it to the side of the body of the tent. You will also find a guy out point on the back of the tent to give you extra space under the fly creating an extra vestibule for your gear. An additional four guy out points allow you to fasten the tent to the ground with the included stakes and guylines. This is a great tent if you have a tight space in the woods and you need to wedge it in between two trees. No matter the surface, you can set it up on rocky terrain or frozen ground. The collapsible tent poles may cause it to be a little heavier, but they are great for those that want an easy to pitch tent. The Salida 2 is a 2-layer type that is typical for 3-season tents. Made of mesh and nylon paneling, the body has pretty good breathability, and the floor features a strong waterproof seam-taped nylon to prevent leakage. The rain fly is made of a similar polyester fabric and is attached to the tent body using is buckles at the end of each of the poles that are all color-coded. These materials are high quality which gives it such excellent rating for this section. The rain fly has a glove like fit to the Salida 2’s dome shape that is great for keeping out the rain. It also keeps out any ventilation, so it can become pretty damp inside the tent from the condensation. This is a great little tent for short trips, especially in arid conditions, and it provides great ventilation with the mesh sides. When the rain fly is attached and completely closed, ventilation becomes terrible, so if you are caught in a rain storm in a hot climate, the inside of the tent will collect condensation making you and your belongings pretty damp. Since the rain fly fits the dome shape so well, it works well to keep out the wind and the cold weather. The rain fly does completely close off the tent, so while it may keep the cold out, it will also prevent any ventilation inside. It is handy for backpacking and camping trips and weighs about 3 pounds 14 ounces. Its packed size is only 13 x 15 inches making it an easy to carry tent for any sized camper. The Teton Sport Mountain Ultra Tent is a line of tents that can accommodate a single camper and up to four people at a time. All of the tents share a similar construction and overall concept, but what makes the Ultra Tent different from its competition is it unique ridge pole system. It is created to provide a wider vestibule and ceiling, plus the micro mesh tent gives you a 360-degree view of your campsite. The provided rain fly will give you privacy as well as protection from the weather, plus it makes a nice vestibule to store your gear. All the tents, except the single tent, have two entrances, so there is easy access from either side. Water is prevented from entering with the very high wall in the bathtub floor, and several mesh gear pockets provide easy storage access at night. One of the best features of the Ultra Tent is that they were designed with the average camper in mind. Set up and take down is quick and easy, and the tent is lightweight making it ideal for camping or backpacking. This is an affordable tent that is also a great value for what you get. These tents are also very spacious providing a lot of head room so that you can move around the tent easily. Condensation is cleared away with a unique pass-through ventilation design to keep the inside of the tent dry and airy. 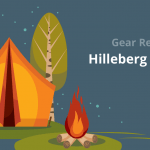 This is a good tent for the average camper or backpacker. The Salida 2 is comparable to the Ultra Tent with its spacious and easy setup and take down. The Ultra Tent does differ with its 360-degree view of your campsite and two entrances making it a little more convenient for two people while the Salida 2 is easier to set up and better at keeping you dry during a rain storm. If you like sleeping under the stars, but don’t want to chance getting caught in a rain storm, the Kelty TN 2 has a rollback fly that lets you enjoy sleeping outside without worrying about getting drenched. When you are camping outside, the 40-denier Sil nylon fly rolls backward on the ridgepole, and it is clipped into place so that the black mesh canopy can provide a planetarium ceiling for the night. In the case of rain, you can easily reach outside the tent to undo the fly and then batten the tent down for the duration of the storm. The TN 2 shines is also an easy to pitch two-person tent that is quite spacious. Set up is a breeze with color-coded pole ends and the interior space is nice and comfortable with a 30.5-square-foot floor and a height of 42-inches. Adequate ventilation is provided to combat condensation in humid locations. This is an affordable tent that is also lightweight and very comfortable. The Salida 2 has many similar qualities to the Kelty TN 2 including a comfortable and easy to pitch two-person tent. The Kelty TN 2 outshines the Salida 2 with its rollback fly and its ability to combat condensation while the Salida 2 can be set up on any surface and is easy to set up in a tight space. 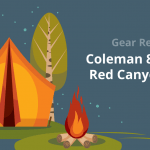 The Coleman Sundome 2 person tent is a very popular tent among campers. It is a good tent if you are camping in a dry climate and will protect you from bugs and the wind. This is a nice inexpensive tent that is good for camping with car access and the occasional outdoor excursion. This free-standing tent has an interesting design as the Coleman Sundome 2 tent has an X-shape pole construction base. This means that you can pitch the tent pretty much anywhere, no matter what the terrain. Even though it is technically a 2-person tent, most find it too small for two people. It is also on the heavy side, so it is best if you use where you have car access. The Coleman Sundome 2 has mesh windows on every side that are a little high to see from, plus there is a low vent opening that can let in some ventilation as long as there isn’t snow or something else blocking it. The body of the tent is made with taffeta which gives you lots of privacy, but not a lot of ventilation. The included rain fly does a good job of protecting the top part of the tent, specifically the mesh opening. 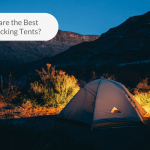 It does not come with a vestibule like many of its competitors, but the small awnings on both sides of the tent help to protect the mesh windows, but it doesn’t have a lot of space to cover your gear. You will also find two interior pouches that will help store small personal items for easy access, and you have a zippered port that allows for electricity connection in one of the corners. In comparison, the Salida 2 does a better job of keeping out the rain, and it is lightweight enough to carry on a backpacking trip. The Coleman Sundome 2 may be cheaper, but sometimes it is worth paying a little more for a better product like the Salida 2. If you are looking for an affordable, lightweight, and easy to use tent, the Kelty Salida 2 is worth taking a look at. As you saw from the Kelty Salida 2 Tent review above, it provides excellent ventilation so you don’t roast overnight, and the included rain fly will give you plenty of protection in case of rain. 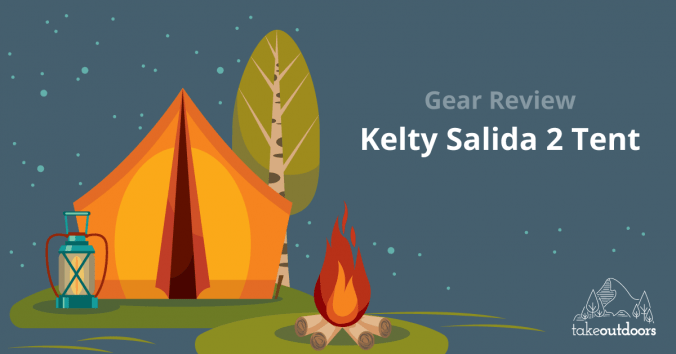 The Kelty Salida 2 is a good value with plenty of features that will make your next camping trip enjoyable and dry.